What is Pink and Yellow All Over? Why my bedroom of course! I was able to get in and paint this weekend; I would have gotten it done sooner except for the bitter cold weather we had at the beginning of the week. It’s a little hard to stand outside and clean up after painting when it’s 14 below. Brrrrrr! I had painted the closet a while ago with the beautiful raspberry pink but I now have the rest of the room done in the lovely lemon yellow. It was such a bright, happy color I didn’t even mind the painting. 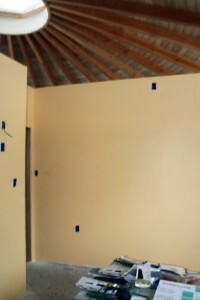 The paint (low VOC as we are trying to do every thing we can to make this house eco friendly) rolled on very smoothly. It was a miserable, dreary day and painting a sunshiney yellow was the perfect antidote! The yellow looks so beautiful next to the raspberry – just as I had pictured it. 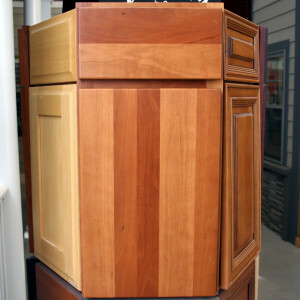 Of course the pictures never look as good as the reality but I am thrilled beyond words with the result. 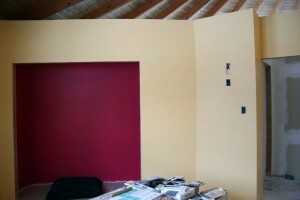 I still have to get the second coat of paint up which I am sure will make the yellow even richer. 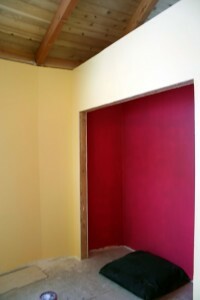 The bathroom is going to use these two colors as well with the raspberry being predominant. The floor is black/grey and there will be a black chair rail to help tone down the pink. That room is next for paint. It’s gonna be bright! I can just imaging waking up everyday to such a warm and welcoming sight. I have a quilt stored away that is yellow and blue with pink accents that is just going to be gorgeous in the room. Of course the raspberry will only be seen when the closet gets opened. 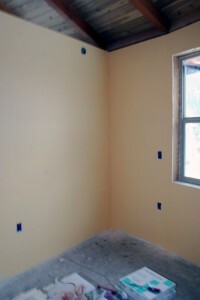 The yellow looks lovely against the wood of the ceiling and will look great against the bamboo flooring once it is installed. So that’s the yurt building update for now. Hopefully things will be moving along now. I hope to get the bathroom primed and painted by the end of this weekend so there should be more news soon!